Parents and Godparents are asked to attend a class prior to the Baptism of any new member of the church that is under the age of 7. If you are seeking Baptism for a child age 7 or above please contact Children's Ministry to inquire about RCIC (Rite of Christian Initiation for Children) as they are acknowledged as having reached the age of reason by the Church. Classes are held in English the first Sunday of each month at 12:00PM and in Spanish the first and second Saturday of each month, in the parish office building with the exception of during the seasons of Advent and Lent. Please contact the Parish Office at 253-833-5130 to let them know prior to the class you plan to attend. There is paperwork that should be filled out and completed in advance of the class when possible. Upon completion of the Baptism class for parents and Godparents you will designate the month you plan to have your child baptized. All arrangements must be made in advance through the parish office. 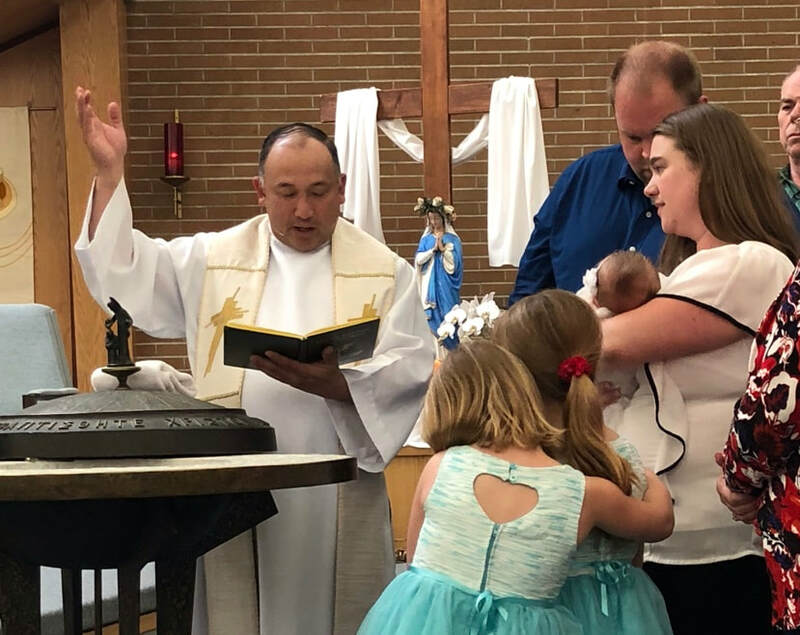 Baptisms are held on the third Saturday of each month following the five o'clock evening Mass. Baptism classes for parents/godparents: April 7th, May 5th, and June 2nd at 12:30PM in the Parish Office. There will be no Baptism class during the month of March. Please contact Catherine Banning at 253-833-5130 to request Baptism paperwork and register for a class. Upcoming Baptisms (after class and paperwork are completed): April 20th, May 18th, and June 15th following the 5pm Mass.